You have had a hard day at work and now it is time to pack-up, lock the office, secure your property and head home. You can now relax with your friends and family knowing you do not have to return to work for another 16 hours. Nothing is going to happen to your business for the time you are away because it has been secured, are you sure? of the night, in response to the alarm activation. What will they find when they arrive at their business premises? There are several possible situations and scenarios that could potentially put your employees in danger. Here are some of the most common scenarios which could lead to your alarm being activated. The chart below shows the Anti-Social-Behaviour and Crime Statistics for Yeovil. If we look at Criminal damage & Arson, Violent Crime, Burglary alone then we can see that any property, business, employee or member of the public is at risk. 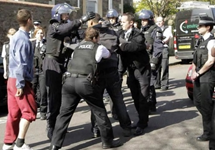 A recent home office survey looked at crime effecting the UK business sector. The survey was completed over 3 years and statistics were published. During the survey, there were 7.3 million incidents of crime against businesses in the six industry sectors covered, which were: Wholesale & Retail, Accommodation & Food Premises, Arts & Entertainment, Agriculture, Manufacturing and Transport and Storage premises. The percentage of businesses that were affected was 40%, a truly staggering number I think you will agree. It’s easy to be complacent and you may think that your business will not be a victim of crime, but looking at these figures, there is a high chance that at some point it will. 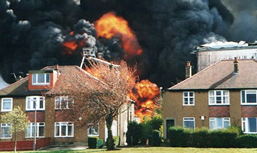 Although there has been a reduction in recent years in the number of commercial and industrial fires in the UK, the financial losses from these fires has risen dramatically. It has been predicted that at the current rate, fires could cost UK businesses as much as £10 billion by 2020. There are more fires in manufacturing than there are in warehouses, but the financial impact on warehouses is far higher because of the loss of products and of stock. because nobody is around to stop them. Fires can spread incredibly quickly, and so time is of the essence. A quick response to a fire is essential. A fire can have an enormous impact on a business, including business interruption, risk to life, loss of reputation and risk to cash flow. A fire can make your company premises uninhabitable, which might mean you must look for temporary or permanent accommodation elsewhere. If there was a fire at your premises out of hours, what impact would it have on your business? Since the turn of the century, we have had three major periods of flooding in the UK: the autumn of 2000, the summer of 2007 and the winter 2013/2014. Initially branded as one off occurrences and “one in a hundred year events”, it is becoming increasingly clear that bad weather is becoming the norm, with many scientists expecting an increase in future years because of climate change. the end of February 2014, around 6,500 properties were effected by flooding, with many of those having to be evacuated. It is estimated that approximately 185,000 commercial properties are at risk of flooding, across England and Wales, and whilst the average losses from a burglary are just over £1000, and the average cost of fire damage £7,300, flood losses can be around £28,000. In the UK, flooding accounts for an incredible 10% of major business disruptions. 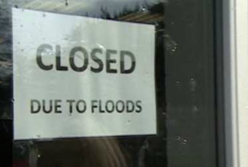 What would happen if your business was flooded? Would your Managing Director or Operations Manager get a phone call in the middle of the night to go out to your business premises? Would your staff turn up in the morning only a flooded building, contaminated with sewage, dangerous damaged electrics, structural damage, rodents, gas leaks, and so on. If your business was not affected by bad weather this winter, then consider yourselves lucky. But are you prepared for the future? High winds can cause immense damage to buildings and activate alarms during the silent hours. Whilst this winter has been relatively calm we cannot be complacent as global warming and the threat of more violent weather your business could suffer badly. This is more likely to be an issue if you have a business premises that are empty, but an alarm could be activated because squatters have turned up and settled in to your property. Only squatting in residential buildings such as a house or flat is illegal. Squatting in a non-residential building or land is not a crime. 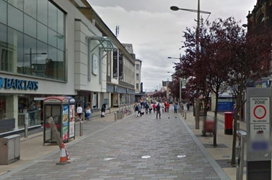 However, it is normally classed as a crime for a person to enter private property without permission and refusing to leave when the owner asks. If squatters commit other crimes when entering or staying in a property, then the police can act against them. This includes causing damage to the property whilst entering or whilst in the property, stealing from property and using utilities without permission. can be hard to get rid of squatters once they have gained access to your premises. 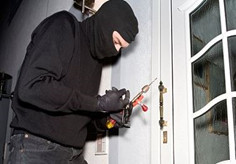 The best way is to make sure your premises are protected out-of-hours so that they do not get in. do you really want your employees responding to an alarm, or turning up for work in the morning to find squatters in your building, prepared to defend themselves? We recommend that you source a security company that provides a Key-Holding or Void Property Inspection Service. Their mobile patrol officers will regularly check your building on his/her patrol route to meet your requirements. You might think that if your business is based in a new building that you are safe from floods, fire, structural damage, being broken into and other threats, but this is not always the case. Experience shows that new buildings are just as vulnerable as old buildings, and that often-old buildings are fare better than new buildings because they are built better – built to last! alarm activation might be putting themselves in more danger than you might think. The area surrounding your property might be safe in the day but is it safe at night? Are there pubs and clubs around and people under the influence of alcohol and drugs? If an alarm is triggered in the early hours of the morning, will your employee be in a safe frame of mind to be driving or will they be too tired and potentially put themselves at risk? And will they know how to deal with any potential threat that might be waiting? Regardless of what your employee finds at your premises, the most dangerous part of the activity might be them journeying to your property. The Corporate Manslaughter and Corporate Homicide Act 2007 is a landmark in law. For the first time, companies and organisations can be found guilty of corporate manslaughter because of serious management failures resulting in a gross breach of a duty of care. Control the keeping and use of explosive or highly flammable or other dangerous substances, and generally prevent the unlawful acquisition, possession and use of such substances. Consult employees on health and safety issues. The Corporate Manslaughter and Corporate Homicide Act 2007 received royal assent in July 2007 and came into force on the 6th April 2008, for the first time, it created a new offence of corporate manslaughter in England, Wales and Northern Ireland, and Corporate Homicide in Scotland. Before the act came into force, a company could only be convicted of manslaughter if every single element of the offence had been committed by one single employee of a company, and if that individual was of such a senior level that they embodied the mind of the corporation. This meant that a corporation was very rarely convicted of manslaughter. Now, it is an offence if the way in which an organisation’s activities are managed and organised causes a person’s death and amounts to a gross breach of a relevant duty of care owed by the organisation to the deceased. The way in which the corporation’s activities are managed or organised by senior management must be a substantial element of the gross breach. If your company’s policy when an alarm is activated out of hours is for an employee to respond to it, and for any reason this led to their death, then there could be grounds for prosecution. “it shall be the duty of every employer to ensure, so far as is reasonably practice, the health, safety and welfare at work of all his employees”. An employee responding to an alarm activation out of hours not knowing what they might find when they arrive; this could lead to a breach of the Health & Safety at Work Act. There are, therefore, a huge amount of problems which can affect your business out of hours when the premises are most vulnerable, and which can put your staff at risk if they must respond to those problems. Common reasons for an alarm activation can range from something small to something huge. It could just be a spider moving across a sensor, or it might have been activated by the wind. Whilst reasons like this don’t put employees in danger, it is incredibly inconvenient that they had to get out of bed at 2am and go to the office for a minor reason. However, there is a good chance that it could be something more serious, as demonstrated above. Having a professional Key-Holding and Alarm Response Service therefore protects your business and your staff from unnecessary risks, costs and inconvenience, and is a cost-effective way to keep your buildings and your employees safe and secure.